Here's a little Saturday treat - a special episode of GameCenter CX that's going to be broadcast live for the whole world to enjoy; it should be a fun watch with host Shinya Arino taking on fan-made courses, so join us to watch it live. Thanks for your company everybody! Now it's time for 'Super Short Courses'! It took some time, but he got there in the end! Fantastic clearance, that was a tricky stage! This is a pretty cool stage. Justin from Canada now. I hope he's watching! That's one stage beaten, good work Arino-san! Wow, this thing has a format and everything. I thought he'd just be picking random stages. That's a big studio, and they're using a tiny corner of it! And we're off, in typically bizarre fashion! Ok, I'm here and looking forward to some Super Mario Maker shenanigans. This should hopefully be a nice bit of Saturday fun. 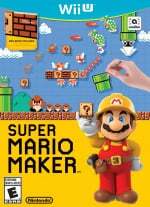 It starts at 5am Pacific / 8am Eastern / 1pm UK / 2pm CET, and is an excuse to see quirky Super Mario Maker levels and chat a bit. Hard to go wrong with Super Mario Maker, to be fair. Wish my course had been featured. Oh well, maybe next time. Is there no escape from Mum?! Makes me think of 9-volts game in Game & Wario. He did pretty well there, to be fair. I wasn't paying proper attention, but I think the theme of this level in something like 'Running From Mum"
No, they did an 'overseas section earileri"
Wait.... do they only play Japanese courses? "My technique was not necessary in the slightest"
Maybe Bowser Castle at last? Why's he trying to actually play a "hold right" course? What's the name of those things you get free at hotels and business meetings? This one should be over with quickly. Kanzaku Ryu's stage, here we go! Oh, for me Maxz, yes, just a bit. "It was sort of dangerous..."
I leave you now for Mira, gents. Have fun! Good luck Nowi, or should I call you Nono. "The scrolling is sorta slow..."
It's a level from from Orebu from Hokkaidou! Surprised he hasn't given up yet. Why did he keep moving! Hit P-Switch and treadmill stops. "Oh... not that! But wait, NOW I've got it!" "3 minds left Mr. Arino, h=please hurry!" "Use one as a wall, the other to activate the coins"
"Aah, but not like that..."
"Kacho gets it!" Now thta I've got the hint, I am massively skilled!" "After stepping on it, throw the shell"
He won't stand a chance against The Impervious Fortress. So what's so great about this stream? are they announcing something? What was that huge, blurry rapid moving thing? Damn, looks like I missed half of it. Probably another hour or so. How long is this on for,any ideas? "Congratulations! Many congratulationary messages are coming thorugh"
It's been 1 hour and 9 minutes, it's time to change the set! "It's pretty tight up here..."
"Ah, forgot about the helmet!" Over 2 million, I think maybe approaching 3 now? that's the thing with SMW levels,a lot who play don't know the different mechanics. how many stages have been made in mario maker? But doesn't Kame just mean turtle? "So close, yet... so far away?" Difficult courses, clear ratio below 10%! "Matsui, please move up one stage, but please be careful!" "This is impossible. Interesting, but impossible"
"Am I this guy? ...Nope." What will he choose now? I want to try this girl's stage! Matsui, please move up a stage and announce the next stage! It's like a festival here. I attempted to make a star with fish in a level, didn't quite look as good as I'd hoped. Number 4, Yuuya, from Tokyo! Argh, the checkpoint was right there! So this course is just for looking at things underwater? I didn't expect people to make levels like these. Good underwater levels are really tough to make. Slightly sad my course didn't get played, but it was close! "Yay! I ddid it Justin!" "Ah, there was a door!" "If you clear, please enjoy some whisky!" Jim's message: "I'm from Scotland! No? What are the odds? Look out for you name! Are they playing random levels? Or submitted ones? Is there any websites that has these episodes translated? Who is he? The guy playing? Voice over: "Can he do it?" Come on man,put the helmet on. "Made it!" That's the end! ...No it's not..."
"Why are there no Super Mushrooms...?" You can wear the helmet and the shoe at the same time? I wish someone told him to take the helmet. Wish I even had the game to have a shot. How great it would be to see your own level appear. "Seems real harsh, Mr. Puni Puni..."
Really? I guess it depends on the person. "Ah, GOT IT! Ahh,,, haven't got it!" I hate levels like that.instant quit. lol, he's like my friend. Keeps ground pounding by accident. "The walls are different (from what I was expecting)"
First theme! 100 star over outrses! I'm sure most of you know this, but 'Hai' means yes/yeah. Hope I don't get spoiled before I get a chance to watch it. Wish I could make it, I'll be away. I think most will be pleased to see it. lol, but the chat is near empty anyways. That bit says Twitter, I can 'translate' that. Oooh, a translator! I only know a few words. "Including many people from overseas"
"It's scary how many people entered..."
Guess I should've expected no subtitles. Might still be interesting, though. Are we the only ones watching this from NintendoLife? Still my favourite TV show ... EVER!